Well, that is an interesting question. Almost as many answers to that question as there are bloggers. Some have stories of their life to tell. While some enjoy writting fiction around a recipe. Some us the daily challenge of blogging to challenge their photography and food styling skills. And some use that same challenge to improve their food preparation skills. Some of us blog for a few family members as a way to preserve family treasures. And many of us work hard to be seen by fellow foodies for suggestions and approval. Most of us are very happy occasionally winning a contest or two, getting a free cookbook in the mail or hoping to get a few dollars a month from a publisher program. But a few of us have a vision. To take those tiny steps (well, not really that tiny) to move from food fan to published food blogger with something to share to someone who is actively working to make food related passion a money making activity. The final step is to becoming a brand. Just look at the Pioneer Woman. Started as a blogger and has moved through all these steps to having her own series premiering on the Food Network later this month. It's called building a brand. I am one of the legions of fans of Ree (the Pioneer Woman). It has been a joy to watch the progression of her brand. 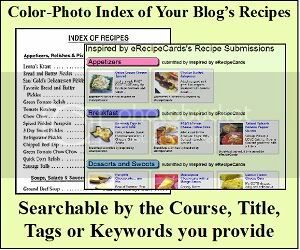 Below are a few bloggers, actively submitting their blog posts on eRecipeCards. They have also taken an extra step. Either as book authors, cooks and caterers, food stylists or even cooking instructors. Who knows, you could be just a few clicks away from meeting the next Pioneer Woman. "My first cookbook, Grits to Guacamole, features recipes from an array of foods along the southern gulf coast. Features include southern dishes, regional seafood and shellfish, my love for Mexican, Cajun and Creole foods plus my passion for grilling and barbecuing. Of course, raised on a farm in central Alabama, cooking down-home recipes comes naturally and many go back for over three generations. Take a look, enjoy real home goodness from my home, my family and around Mobile." FRANCE! Home to ex-patriated American Katie offers a weekly menu plan of gourmet dinners paired with a shopping list of seasonal fresh ingredients that reduces waste... With a FREE test week that will save the cost of your subscription! And BTW, if you have a product for sale, book available, classes offered or maybe even a B&B in the south of France... Drop me a note. I want to include everyone making that one small step (or giant leap).